Screenshot YouTubeUnited Steelworkers Local 2227 President Scott Sauritch and Donald Trump. President Donald Trump suggested Thursday that a steelworker’s father was dead. 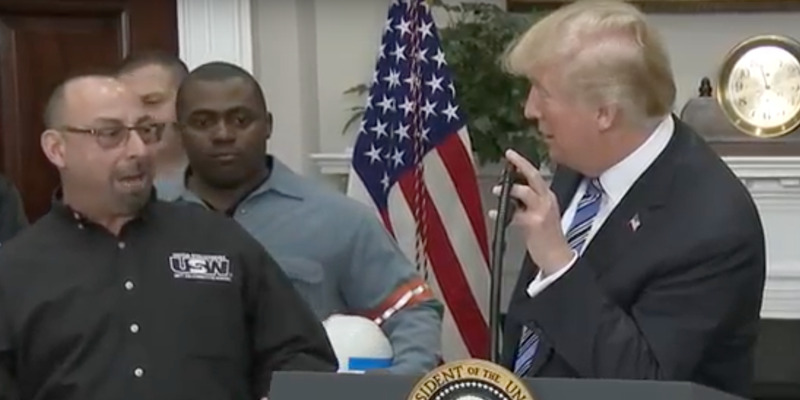 The steelworker had just spoken at Trump’s major tariff announcement. The steelworker’s father, however, was not dead. President Donald Trump on Thursday mistakenly suggested a steelworker’s father was dead during an announcement on new steel and aluminium tariffs. The man quickly corrected him. Speaking during the announcement, United Steelworkers Local 2227 President Scott Sauritch told a story of when his father lost his job in the 1980s as a result of cheap steel imports coming into the country. Evidently, Trump caught Sauritch talking about how his father’s story “didn’t end,” and assumed it meant his father had died. “Then he’s even more proud of you,” Trump said, laughing with others in the crowd about the slip up. Steel worker immediately replies: "Oh, he's still alive!"